FAQ - our advices in a click! FAQ – our advices in a click! Questions and answer about the usage of laudry and home detergent. How to choose the right dose? The eccessive use of detergent doesn’t increase the efficiency, on the contrary low doses may be insufficient to remove the dirty completely. On each of fiorillo laudry there is the dosages schedule which enables the client to establish the perfect quantity for every washing. The choice depends on 3 factors : the degree of dirty (written in the columns) water hardness (written in the lines) and the quantity of laundry. What do we mean by water hardness? It is the quantity of limestone in a liter of water and it is measured in french’s degrees. It is an important element to establish the quantity of detergent. The iones (calcium and magnesium) that are in the water, influence the washing. The higher water hardness will be the higher the quantity of detergent you will need. On the contrary in soft water a lower quantity of detergent is needed. How do you know the water hardness in your zone? If you do not know the hardness, you should ask the water company. The details to contact can be generally found in the water bill or on the internet. Why should we respect the recommended quantity? If you use a low quantity of product, your clothes tend to wear out, harden and loose elasticity. The recommended quantities prevent the formation of limestone on your clothes and in the washing machine. How do we interpret the symbols of dirty in the dosage instructions? Lightly soiled There are are not stains or visible dirty. Examples: summer and gym clothes (used for a short time) shirts, t-shirts toilets and sheets (used only for a day). Normally soiled: Visible dirty and stains. Examples t-shirts and shirts (used for more than one time) linen (worn for a day) toilets and sheets (udes for one week). Heavily soiled: Visible dirty and various stains. Examples: kitchen linen, tablecloths, working clothes, football clothes (grass stains), etc. How do we separate the laundry? First of all you should check the information wrtitten on the labels in order to make a distinction according to temperature and type of cloth. Separate dark clothes from light ones, putting together the clothes with the same colour that need the same temperature. How can you avoid the loss of colour of new clothes? New clothes can release colour during the first washing, for this reason we recommend to wash them at low temperatures. How can you load correctly the washing machine? First of all, check the technical details of your washing maschine. Alternate small clothes with big ones. Use the right quantity of detergent because higher doses ruin washing quality, as well as the clothes and the washing machine. In order to avoid the fall of buttons, turn the clothes upside down and button them. Avoid too heavy or light loads, you should follow the loading instructions according to the selected programme. Why should you do low temperature washings? Fiorilllo laudry is efficient even at low temperatures. High temperature washings waste water and electricity. It is important to wash clothes at the right temperature, you can save almost the 50% of energy with washing cycles at 40° C. Furthermore, low temperatures together with the right dose of detergent, reduce the loss of colour and the damage of fibers. Why should you use Fiorillo softener? The use of Fiorillo softener is recommended because it makes your laundry softer and more perfumed as well as facilitating the drying and the ironing. How can you remove a stubborn stain from a cloth? If a stain hasn’t moved out in the first washing cycle, we suggest to treat it with a higher dose of detergent before the next cycle. Otherwise, you can soak it all night and use 140 ml of Fiorillo laundry Colormix in 10 lt of water. Is it possible to wash lightly soiled linen together with heavy soiled one? It is not recommended to do so. Heavy soiled linen need more detergent, while lightly soiled linen can be washed at 30°C with less detergent. In this way you will save energy and product. How can I guarantee the environmental safeguard by washing in an eco friendly way? It is important to wash correctly in order to respect the environment. It is necessary to separate clothes, to treat the stains, to use the right dose of detergent, to choose the right programme. How can you wash your jeans? Do not load your washing machine excessively and turn them upside down. Use Fiorillo Dark Clothes and opt for a programme for delicates. Which detergents should you use for whites, coloured, delicates, in wool and silk? Pre washing yes or not? How can you wash your curtains? Do not load your washing maschine eccesively, wash at 30°C with Fiorillo Colormix or Fiorillo Laundry Liquid. Centrifuge at low rpm for a short time, do not leave the curtains in the basket for too long to avoid folds. Add Fiorillo Softener to obtain a pleasant perfume and softness. What is a liquid detergent for hand washing? Why is it recommended to wash dishes in hot water? The increase of temperature during the washing is important because it makes the removal of grease from your flatware easier. However, with Fiorillo dishwashing you can obtain good results even in cold water. 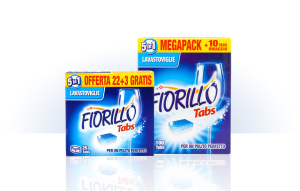 How do i use fiorillo tabs 5 in 1? Put the tab in the detergent’s tray and close it. Use one tab for each washing. Make sure that all the flatware can be washed in dishwasher and separate steel from silver. Follow the producers instructions to wash metallic objects. Is it necessary to prewash the flatware before putting them into the dishwasher? It is not necessary. The prewash has lost its importance because of modern dishwasher and efficient tabs. This method makes you waste water and time. Fiorillo tabs contain enzymes that break the proteins and starches. Throw the remaining food and then put the flatware in dishwasher. Sometimes people make confusion about what they can wash in the dishwasher. For example, it is believed that objects like pots, crystal glasses, sharp knives and teflon pans cannot be washed. If the manufacturer claims that its products are safe for the dishwasher, they can be washed without any problems. Have I to add limescale remover to my dishwasher? No, you don’t. Fiorillo tabs contain a special ingredient that prevent the formation of limestone. No it doesn’t contain substances with that features. Is it possible to add a disinfectnant to the water containing Fiorillo detergent? No,it is not recommended to mix various products because they can produce chemical reactions and toxic products. Is it recommended to use Fiorillo Floor Detergent where there are animals? Is it dangerous for their health? Fiorillo Floor Detergenet is not demaging for their health. Why should you clean the floor with warm water? Because it facilitates the drying. We suggest to follow the instruction written on the label. Does Fiorillo floors detergent need to be rinsed? How do I wash greasy floors? Spray Fiorillo degreaser on the greasy point, remove the dirty with a cloth and then clean the floor normally with Fiorillo Floor Detergent. Why should I use Fiorillo Form? Fiorillo form home is a detergent with a high cleansing power. Thanks to its particular hygienizing action, it can be used to clean toilets and floors, etc. Does Fiorillo Floor Detergent contain toxic substances? All Fiorillo products are made of raw materials that guarantee the best ecotoxicological compatibility. Is it possible to use fiorillo degreaser on clothes? Yes, it is. It removes grease and oil from your working clothes, your towels and linen. Is it possible to use Fiorillo Ammonia on aluminium, ceramic and marble? Is fiorillo ammonia apt for hygienizing toilets? Can I use fiorillo ammonia to clean the hobs? Yes, it is suitable to remove stains. Is it apt for removing bad smells? Yes, it removes humidity smells, sweat smell from training clothes, mildew smells from texiles. How do I wash heavily soiled rags? Soak them for 2 hours in a basin containing 3 or 4 cups of ammonia, before the washing cycle.